FRIENDS TV Yellow Peephole FRIENDS FRAME . #1 Replica. As seen in Monica's door in FRIENDS. 100% Handmade. It's the best replica you can find. Great present for a FRIENDS fan! 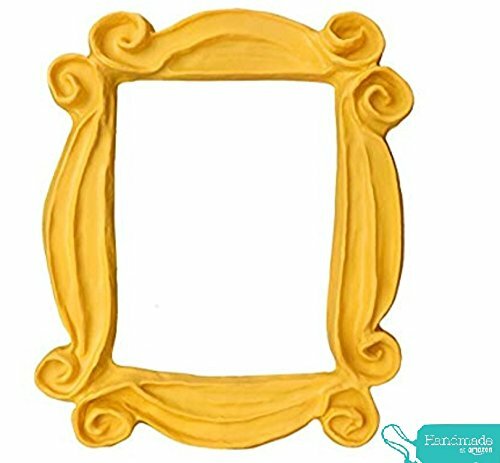 Here you can buy the best REPLICA of the frame that was in Monica's Apartment door. The Peephole Frame most famous in the world. It is 100% handmade and hand painted with very high quality resin. It will last forever!!. Light weight. You don't need to make any holes in your door to hang it because you can do it just with double side tape. (Already on!). The size is 10 inch tall and 8 inch wide aprox in the outside. I made it with sturdy resine. The lovely and Perfect Gift for who loves the FRIENDS TV SHOW. Perfect gift for any FRIENDS fan! Don't wait there are just a few! #1 BEST SELLING Friends memorabilia. Own a piece of your favorite show's history with the #1 replica from F.R.I.E.N.D.S. INSTALLS EASILY You can do it with 2 sided tape (Of course, INCLUDED) . So you can hang it as soon as you receive it!! It is 100% handmade and hand painted made with very high quality resin. It will last forever!!. Everybody loves it! Don't miss it! Tell your story of true love with this inspiring collage picture frame! The Kiera Grace True Love collage frame holds four 4 by 6-Inch photos. This frame is a fantastic way to display and celebrate your love for everyone to see. It also makes an excellent gift for wedding day, wedding anniversary, Valentine's Day, or for newlyweds.